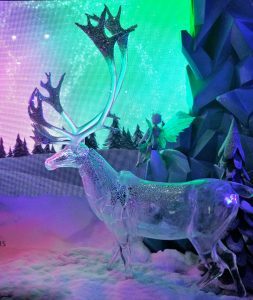 Fproduct advanced mold making skills were recently sought to complete a 6 window Christmas Holiday display for Macy’s flagship department store (Herald Square, Manhattan). This year’s theme “Dream…and Believe” depicted a young boy’s dream of the magic and wonder of Christmas that include the fabrication of 25 ice crystal-like forest animals (1 Bear, 2 Deers with antler, 1 Doe, 4 Squirrels, 4 Foxes, 6 Rabbits, 6 Birds and 1 Owl), which were all completed within 2-month period. The molds and castings of the pieces were made using the most rigorous processes to ensure detailed perfection with every item.